Act On File 2012 - The Authenticator Module - The Hash Files Functionality Hash Files - Easily Create and Compare Hash Codes of Files and Data. Hash Files - Create Hash Codes of Files and Data. This section discusses the Hash Files functionality of the Authenticator module. The hashing of a file is a procedure which generates a very large number with a fixed length from the content of the file. Thus, the hash of a file is a kind of a file signature. However, the file cannot be restored from the hash. Additionally, hashes are not unique, i.e. two or more different files may have the same hash. Hashes are optimized to be duplicated as rarely as possible, and usually it is uncommon to encounter hash duplications in a particular universe of discourse. There are several different algorithms usually used to create hashes. Hashes are often used as simple non-personalized signatures of data. For example, many download sites list a hash code next to all download files produced from the respective download file. Thus, users are able to hash the file after they downloaded it and confirm (with a high degree of certainty) that the file was downloaded without errors if the listed and produced hash match. Hashes are also used for producing digital signatures and have multiple other applications. 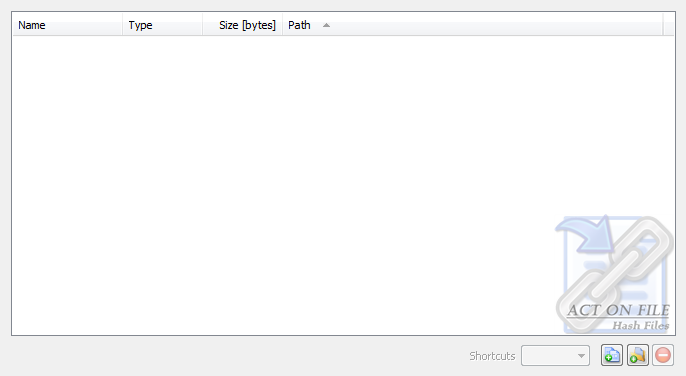 To hash files you need to select the files and folders in the selected items control of the Hash Files functionality. Adding folders to the selection controls makes Act On File hash all files contained in the selected folders. If there are any shortcuts in the selected folders, they will be followed or ignored according the selection in the Shortcuts combo-box. 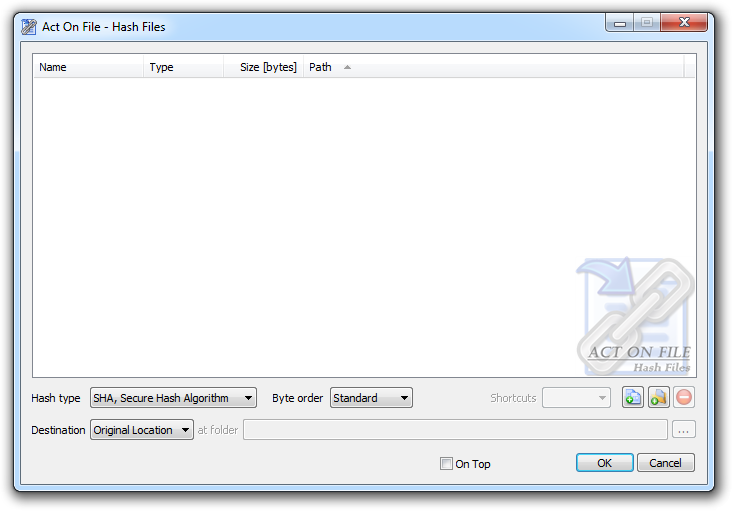 After the items to be hashed are selected you need to adjust the algorithm controls and the destination of the hashes. When ready, click OK to start the process of hashing. When the newly created hashes are stored as files, they are named using the name of the hashed file as follows: "[hashed filename]. [hashed extension].hash". These controls are used to select and display the files and folders for the operation. In addition to the Add Files, Add Folders and Remove buttons, you can use the standard clipboard, drag and drop, and keyboard operations. Hash type Select the algorithm to be used to create the hash. Byte Order The hash can be stored in its Standard or its Reversed byte order. The Byte Order is important when comparing hashes. Be cautious as different platforms may produce reversed hash codes. For example, a hash generated on an a native Intel platform may read, for example, "1234", whilst on a network-standard platform it may read "4321". Standard Produce hashes in their standard byte order. Reverse Produce hashes in their reverse byte order. These controls are used to direct the location at which the the module will save the hashes. Show as Text Each file and its Standard and Reverse hash are displayed in a window and can be visually compared or otherwise used. Common Place All produced hashes are stored in the target folder and are named "[hashes filename]. [hashes extension].hash". Caution is required as hashes with matching names may overwrite each other. Original Location The hashes are deposited in the same folder in which the hashed file resides and are named "[hashed filename]. [hashed extension].hash". Reflecting Tree The directory structure of the selected files and folders will be replicated under the selected target destination folder. Each produced hash is named "[hashed filename]. [hashed extension].hash" and is deposited in the newly created folder respective to the hashed file containing folder. OK Commits to work and creates the required hashes.